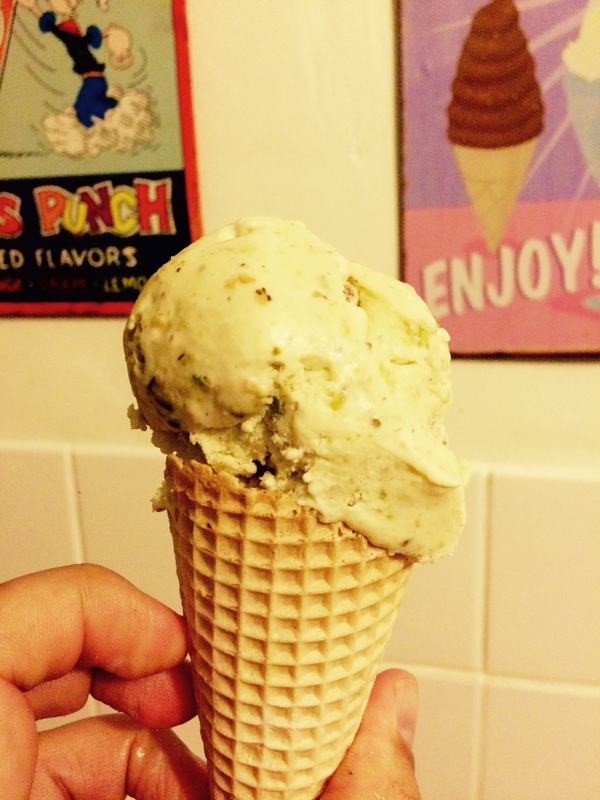 I didn’t get to make ice cream last week as I had a bit of a busy one but have been wanting to try making my own pistachio ice cream for a while. We had a local supplier make a version for our ice cream van but whilst it was gelato rather than ice cream it really didn’t cut it for me so Ive spent the weekend researching different methods. There seem to be two schools of thought on the perfect pistachio iced treat – either gelato with no egg but using cornflour (cornstarch to my american chums) or more traditional ice cream using an egg based custard. I’ve settled on the recipe below as a compromise, using good bought custard (which is still not egg based), seems the easiest and I like the idea of whipping the cream to give a really creamy base to bring out the best in the pistachios. Finely grind 3/4 of the your pistachio’s in a food processor. Finely chop the remaining pistachios and set aside till later. Whip the cream to soft peaks. then fold in the custard. if you want a smooth ice cream then at this point strain the milk to remove any nut dust (no jokes please lol) I didnt bother as i like nut dust- either way add this to the custard mix and combine fully. So there you have it, creamy, nutty, gorgeousness with limited work (the hardest part was stirring the sugar and milk as everything else involved a machine!!) DIVINE!!! On the colour – this wont have the creamy green of bought pistachio ice cream as it hasn’t got any food colouring added. If this is your desire then feel free to add – but I like this more natural look and feel, and the addition of the nuts to the ice cream means you get a more rounded taste. on the serving suggestion – You don’t have to enjoy this ice cream from a waffle cone OR in front of Downton but until you have tried it you will never know – but lets face it everything is better with Downton! !